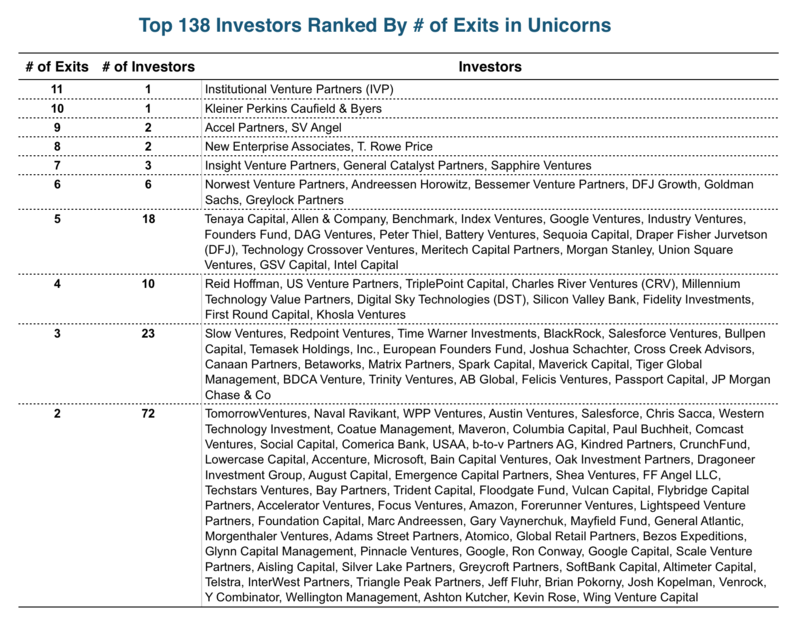 tl;dr: Most of the capital invested into unicorns and almost-unicorns is still waiting for its exit. And a surprisingly small number of investors have actually cashed in on their bets. Everyone wants a chunk of a unicorn these days. There’s a legitimate case to be made that investing in these later stage technology companies is less risky because the companies are more mature. These investments may generate a solid return rather quickly, assuming the capital infusion was timed correctly before an IPO or acquisition. Intuitively, equity in these companies feels safer than investing in some Series A-stage company with a lot to prove. What is a unicorn? A common definition is “a privately-held technology company that is valued at $1 billion or more.” But that strict, private-companies-only rule leaves out many companies. In 2013, Aileen Lee of Cowboy Ventures defined a unicorn as a “U.S.-based software companies started since 2003 and valued at over $1 billion by public or private market investors”[emphasis added]. But with so few private company valuations known to the public, this definition has its issues too. For our purposes, we’re going to focus on public and private US-based software companies founded in or after 2003 that have raised $100 million or more in private funding as a rough proxy for unicorns and their peers. Recently, I spoke with someone who manages investments into VC firms for a nonprofit endowment fund. They had a hunch: many investors with flashy portfolios and high internal rates of return may look great on paper, but this is mostly because their gains are only on paper. Right now, there is a lot of money invested in unicorns but comparatively few liquidity events. So who has cashed in? The two main sources of liquidity for private company investors—IPOs and M&A—are experiencing a slowdown. Although Twilio, Line, Acacia, and a few other recent IPOs were successful, the distribution deluge they brought to investors come at the end of a long drought. But for the next few months, the IPO calendar is looking pretty barren for now. According to a recent report from Silicon Valley Bank, over two thirds of the companies valued at $1 billion or more that went public over the past couple years are trading below their IPO valuations. Public market conditions are such that there is an incentive for late-stage companies to stay private longer, and there are new funding mechanisms in private markets to support their growth, such as the billion dollar debt rounds raised by AirBNB and Uber, the billion dollar convertible debt deal struck by Spotify, and the $75 million pre-IPO debt loaned to Nutanix by Goldman Sachs. However, each one of these deals is notable, not for their size, but for the aggressive terms investors attached. It’s getting more expensive for these big companies to keep growing using private money. These unicorns are not terribly appealing to the M&A market either. According to CB Insights, there are plenty of $1 billion+ tech company acquisitions—21 so far this year as of late July—but just two of them were valued at $1 billion or more in their last round. This signals to many that equity in unicorns is overvalued. If stakeholders in private unicorns might face an uphill battle to actually realize the upside they gleefully report to their investors, we once again ask: who has successfully cashed out? Of the 338 companies we originally analyzed, 27 have gone public and 42 were acquired. A total of 427 individual and institutional investors deployed capital into these 69 companies. Like we’ve seen in previous investor-ranking exercises, the bulk of the (realized) gains are concentrated at the top. To conclude, we’ve learned a few things here. First, most of the gains and returns investors can attribute to unicorns are unrealized. They can be wiped away with a down round or low-balled buyout offer. Therein lies the difference between internal rate of return and cash-on-cash returns. Investors only benefit in a material way from the latter. Second, and unsurprisingly, we learned that actual cash-on-cash return events are highly concentrated among basically the same handful of investors we’ve previously identified as top performers. Investors in these unicorn companies find themselves between a rock and a hard place. 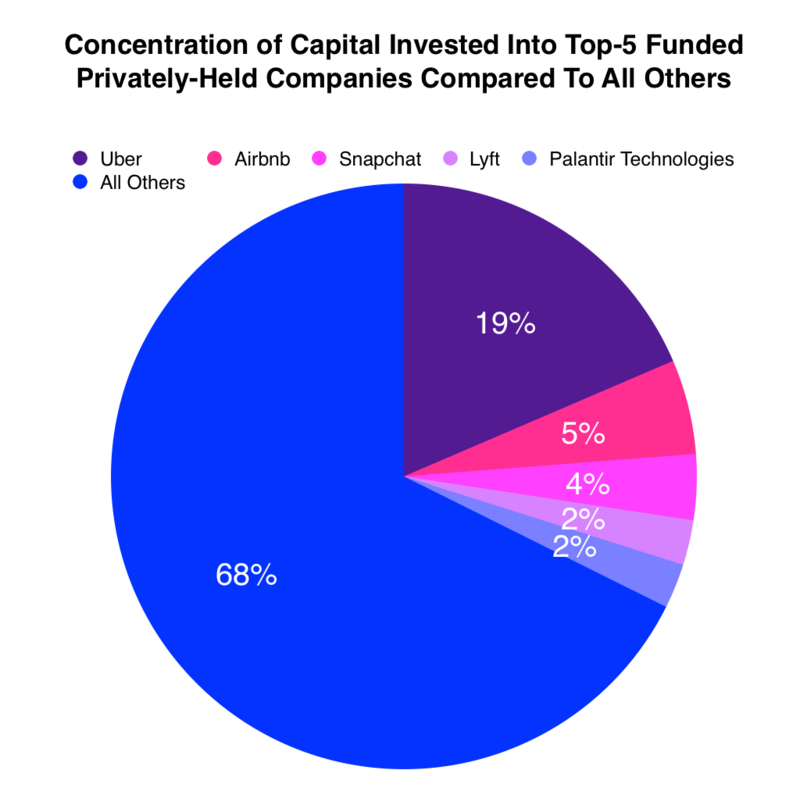 Unicorns have such high valuations from private investors that they might not live up to the hype come IPO time, and there’s a widening set of options to finance the growth of these companies without public market scrutiny. It wouldn’t be surprising, then, if investors are stuck waiting even longer to actually cash in.